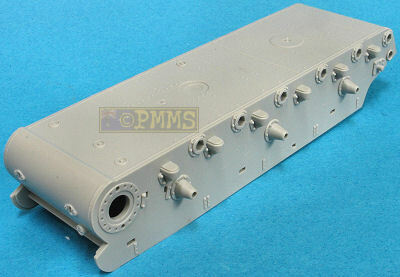 Following on from their T-34 series Hobby Boss have released the first of their KV series which again sees the Trumpeter 1:35 KV kits given the ACME shrink ray treatment to produce some nicely detailed models that assemble quickly and relatively easily in the smaller 1:48 scale. 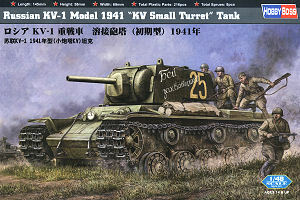 The first of these is this kit of the KV-1 model 1941 “Small Turret”, which in reality is more a Model 1940 KV which was armed with the early short barrelled L-11 76.2mm main gun in a welded turret and featuring the initial rubber lined resilient road wheels. This model is the equivalent of the Trumpeter kit #00356 of the same name and also the same model as the recent Tamiya 1:48 KV-1 (kit #32535) and I will include brief comparisons along with a detailed look at the Hobby Boss kit. 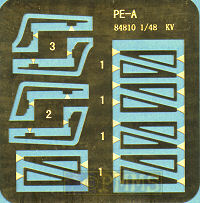 The kit consists of 215 parts in light grey plastic with a small etched fret with 14 parts, a length of copper wire for the tow cables plus the decal and instruction sheets. The quality of the mouldings is excellent with clean crisp details and a minimum of pin parks with those present being very shallow for easy removal. There is some very minor flash around some parts but a quick pass with model knife or wet and dry deals with this along with the normal small mould seams on the parts. While there is not a lot of parts there are many small finely moulded parts and excellent surface details such as weld seams and bolt/rivet head details that all add to the overall quality feel. The kit includes some parts applicable to the other kits in the series with some duplication (e.g. head light, siren and tow shackles) and you should ensure you use the parts indicated on the instructions for this kit and add the rest to the spares box. Dimensionally the kit measures up very well overall compared to the reduced 1:35 plans in the Tankograd books with just a couple of minor issues but the reduction process has resulted in a few minor fit issues that require a little attention but nothing major. The lower hull is a traditional tub with bottom, sides that include the sides of the upper hull as with the Trumpeter kits, the lower front panel and includes the curved rear panel moulded in place with nice weld seam and other details included which basically means there is no assembly of the hull tub. There is underside detail as well as nicely defined mounting brackets for the separate axles, bump stops and other details. One issue is there are engraved locating points on the hull sides presumably for the later “Ehkranami” version with appliqué armour panels added and the instructions indicate these locating marks should be eliminated. Unfortunately due to the amount of detail surrounding the marks this will be a very difficult undertaking without damaging the other detail and you may want to just leave these as they are not that noticeable after assembly or cover with mud in the finishing process. The separate axles have hexagonal locating stubs that fit into corresponding hexagonal holes in the hull sides just like the Trumpeter axles ensuring they are positioned at the correct angle and have nice details on the axle hubs. The resilient road wheels are made up of two parts each with the inner and outer wheels that have quite nice hub detail (better defined than on the Tamiya wheels) but the ring of outer lightening holes are not completely round having the outer edge straight and you will have to drill out each of these holes for a round profile. This is not as easy as it sounds as the drill bit has a tendency to “walk” away from centre due to the partial opening and care is needed to keep the drill bit on line. I didn’t bother with the inner wheel holes as these are difficult to see after assembly and you can save a bit of time not drilling these. The drive sprockets have bolt head and other details on both sides of the inner and outer disc as well as having the central hub disc as a separate part with the correct number of retaining bolts for this version. The inner rim bolts stick out way too far but it’s easy to trim these and there was also a bit of sanding needed to slightly reduce the diameter of the central hub as the fit to the sprocket was not the best initially. The idler wheel mount has a separate tensioning arm for good definition while the idler wheel has the two wheel discs with excellent rib details and the two part return rollers are also the correct type for this model KV with well defined details and finally there is a the drive sprocket clearing device fitted to the rear hull sides. Remember that you have to fit this device at the same time as you attach the drive sprockets as to it can’t be added later. At either end are separate towing attachments and shackles that fit neatly in place. These are the same style plastic link and length from the Trumpeter kits that incorporates pre-formed track sag along the top run and another long section for the ground run with individual links for around the drive and idler wheels. The details on the track are again excellent with nicely done cast details but there are some shallow pin ejector marks on the inside next to the guide pins which are more prominent on the individual links to be removed which shouldn’t be a problem. As these are on the inside of the teeth guide holes they are not that noticeable as the road wheels cover many of them as well as the drive and idler wheels hiding those around them and so are not as obvious as if they had been on the outside of the tracks. Included in the kit are two jigs to aid in assembling track that are made up of two parts each but note they are different for the drive and idlers wheels so don’t mix them up. These jigs are designed so the guide teeth fit between the two jig halves and they make assembling the curved track sections very easy. I assembled the sections around the jig and let the glue dry completely before fitting to the model and the fit around the drive sprockets and idlers was very good. But remember to fit the tracks before adding the fenders as trying to add these later is very difficult and if you glue the drive sprockets in place all but impossible after the fenders are attached. I also found it was a lot fiddleier to get the assembled track segments to fit together than with the Tamiya tracks. The upper hull panels are in two sections with the forward section including the turret race forward to the glacis and the rear engine deck; this allows easy replacement of the engine deck for other versions without replacing the whole upper deck. The fit of these panels to the lower tub required a little trimming along the sides and there are four locating lugs that fit into recesses on the inside of the lower hull tub and these resulted in the top panels not fitting correctly and so it trimmed these lugs accordingly for a better fit. Any minor edge gaps are small enough to be filled with glue as you attach the panels and at the front is a separate nose cap with subtle rivet details that again needed minor trimming for a better fit. There are subtle weld seams on the forward hull section and excellent bolt head and panels details on the engine deck as well as inner vanes under the two side intake grills. These side intake grills are moulded solid with nice mesh details as with the Trumpeter covers but there is only one style of grill included, that with one flat end and one rounded end and obviously these hide the inner vanes but there will no doubt be replacements offered in the inevitable etched updates sets to come. The locating holes for the grill covers had to be opened up for the grills to fit but this is easy enough to do and also make sure the bottoms of the grills are smooth to ensure a flat sit on the deck. The front crew hatch has a separate hatch ring and the hatch has interior latch details as well as a small hinge to allow the hatch to be positioned open if required. The fit of the hatch required a bit of trimming of the hull opening and slight reduction in ring diameter for a better fit but again nothing very difficult. On the driver’s plate is a separate visor cover, horn with separate wiring ducting, the head light and three part machine gun mounting as well as separate periscope cover on the hull top all with well defined details including the rivet detail around the visor. Note there are two head lights and horns provided but one set are much chunkier than the ones indicated to use (parts Q1, Q2) so make sure you use the right ones for a more refined appearance. The engine deck has separate round inspection hatches again with interior latch details and hinge as well as a separate central domed engine access hatch with the centre fitting included in the moulding and depending on references this may have to be sanded off, not a big deal. Also added to the engine deck are the separate exhaust outlets with the nozzles slightly hollowed out for a nice look in this or any scale. Detail on the deck is well done but there is a minor issue in that the deck is about 0.5mm narrower than the plans and the Tamiya hull which results in the central access hatch (part N9) being that much narrower as the spacing of the two side intake grills is correct but at the end of the day is probably of little consequence as it’s basically un-noticeable. There should be a panel join line between the two rows of bolts just behind the exhausts which is not there and this should be easy enough to scribe in (see the Tamiya hull for placement). At the rear are three additional panels that make up the curved rear hull panel and engine louvers and the exhaust outlets located under this with the grill work finely moulded but again will probably be replaced in the etched update sets with the fit of the parts being good overall. The copper wire provided is used for the two tow cables and are attached to the end sections which are pre-formed to drape over the front hull section for a more realistic finish. These are separate full length wider type fenders either side with very nice surface details of rivet heads and securing strips as well as a nice outer lip and also include the longitudinal centre stiffening bar on the undersides. You have to open up a few locating holes for the fender storage boxes and other fittings applicable to this version before assembly, so check the instructions carefully and there are some shallow pin marks on the underside that are easy to remove. One thing of note here is the forward side panel between the fender and glacis which is included with the main fenders and moulded using slide moulds resulting in well defined details on this panel but a little flash was evident requiring trimming. Added to the fenders are the three storage boxes moulded closed as well as other equipment that but I found it easier to cut off the location pins on the boxes and simply glue them to the fenders as the pins were more of an annoyance than anything. The turret is split in two halves with separate roof plus front and rear panels added but after fitting these there were substantial joins to be eliminated at the sides and care will be needed not to damage the weld seam details in the process. The details on the turret include nice weld seams and rivet details and top ventilator with all other parts separate. You have to trap the inner gun mount between the two turret haves as you join them together and this was a very snug fit which is good as the gun won’t flop about the place after assembly. On the top is the early style forward sighting periscopes and side and rear facing periscope covers with nice retaining bolt details as well as two grab handles which are a little on the chunky side . The top hatch again has internal latch details and separate hinge allowing this to be shown open but there are no interior details to show and the rear machine gun is made up of three parts that fit together well. Just a quick note of the upper ventilator as the three inlets are orientated differently on this and the Trumpeter kits than on the Tamiya kit and images in the Tankograd books show that both kits are correct as the different orientation is simply a variation often seen on different vehicles. The fit of the roof to the turret results in the small step around the edges as it should and there is also weld texture around the edges of the roof but the turret halves when joined were not perfectly square (un-noticeable to the eye) and it may be an idea to fit the roof while the two side joins are still pliable to ensure everything lines up correctly. The gun mantlet has excellent details with well defined bolt heads and a separate end cap but again there is a large join seam to be filled and the L-11 76.2mm gun tube is in one piece with hollowed out muzzle and just a small moulding seam to be removed. The thin metal mantlet cover is moulded commendably thin and looks very much to scale when fitted adding to the nice detail of the turret. These are the usual exploded view drawings and are very clear and easy to follow although you should read the opening steps carefully to determine what if any locating holes need to be opened up for the different fittings. 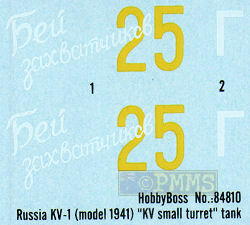 The small decal sheet is nicely printed with thin carrier film cropped close to the printed image and gives you turret numbers and slogans for three KV-1s. As with the bigger Trumpeter kits this is a very nicely moulded and detailed model of the KV-1 with well defined details such as the weld seams, bolt heads and other fine details along with the etched fender supports captures the features of the Model 1941(1940) KV-1 very well. The level of detail is much finer and more refined than on the Tamiya KV but there are a few minor fit uses and a bit more work required but the end result is an excellent KV-1 when built OOTB or with any of the update sets bound to come. Thanks to my long suffering Credit Card for the review kit.